Discover the Honeysuckle Inn & Conference Center where you’ll find comfortable accommodations in a convenient Branson location! Neighboring attractions and dining include the IMAX Entertainment Complex, RFD Theater, the Butterfly Palace, Golden Corral, Red Lobster, and so much more from which to choose! And being right near the intersection of Shepherd of the Hills Expressway and Highway 76, it’s one of the two in-town lodging properties closest to Silver Dollar City and the Shepherd of the Hills Homestead. It’s always nice to see beautiful and well-maintained landscaping, but the “Honeysuckle” makes their award-winning grounds accessible. You’ll find a porch and picnic areas that make for a nice refuge after a hectic day! Other special features include a huge outdoor, kidney-shaped pool, an indoor pool and hot tub, and expansive meeting space that will accommodate up to 130 people. With catering and audio/visual equipment available on site, 210 guest rooms, and plenty of level parking, having your meeting or reunion in Branson at the “Honeysuckle” is an easy decision! 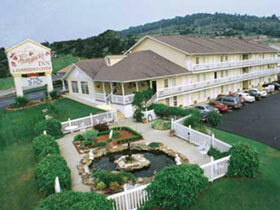 With a convenient location and all the essential amenities, as well as unexpected features, the Honeysuckle Inn & Conference Center is the ideal lodging in Branson, MO. Contact Branson Tourism Center to learn more!